JSC RZD Logistics has launched test multimodal shipments of cargo from Japan to Russia across Trans-Siberian railway in containers, equipped with temperature, moisture and vibration level sensors. The project is realized in accordance with the agreement between JSC Russian Railways and Ministry of transport of Japan on the increase of volume of Japanese goods’ multimodal shipments across the ports of Russia’s Far East and Trans-Siberian railway. On August 17th, RZD Logistics sent a 40-foot container in direct traffic from port Kobe (Japan) to Vostochny Port (Primorskiy Krai, Russia). After that the container was placed on a platform and sent as a part of accelerated container train, which goes according to the schedule “Transsib in 7 days”. The container will go by railway under the regime of inner customs transit to Vorsino station (Kaluga region). From there it will be transported by auto after customs procedures to the warehouse of a consignee in Khimki town (Moscow region). The expected date of arrival to Vorsino is August 31st. Thus, the general time of delivery to terminal will be 14 days. The railway delivery is fulfilled in partnership with PJSC TransContainer. 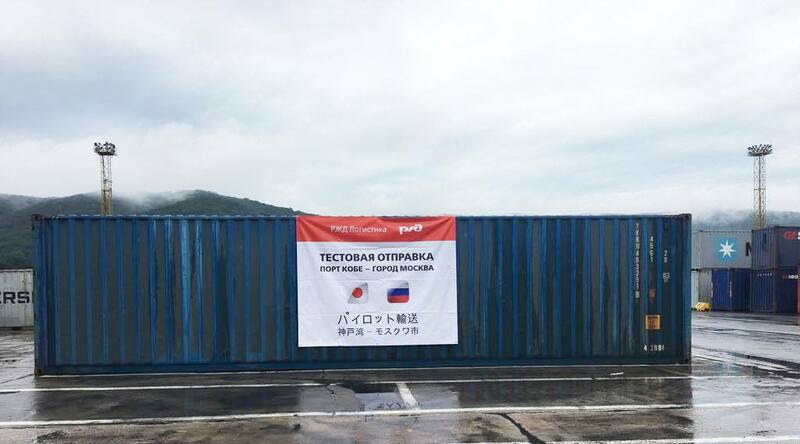 The next shipment in the framework of the project of test shipments from Japan to Russia across Trans-Siberian railway is scheduled for August 31st. RZD Logistics will send a 20-foot container across the route Yokohama – port Vladivostok – Silikatnaya station (Moscow region). A solemn ceremony supported by Japan’s Ministry of transport will be organized on the occasion of a test container shipment on August 29 in port Yokohama. “This project is a huge “logistics step” towards Japanese consignors. Especially for them in the end of 2017 RZD Logistics organized a “single window” service of Russian Railways Holding. This service is designed to provide clients from Japan with information support and high-quality cooperation. We have launched test shipments, which will allow us together with Japanese colleagues to choose optimal working route across Trans-Siberian railway. In the framework of test shipments by the end of 2018 we will be able to check and prove the delivery speed. The use of temperature, moisture and vibration level sensors is an important innovation, taking into consideration the fact that Japanese companies deliver mostly high value added goods”, – commented CEO of JSC RZD Logistics Viacheslav Valentik.